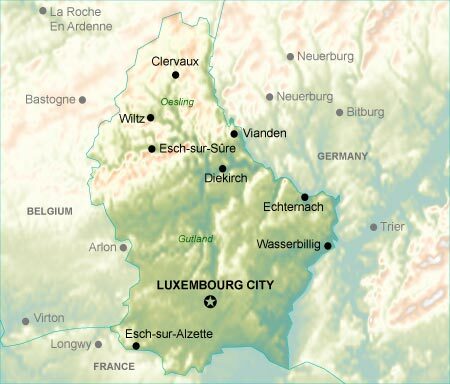 The Grand Duchy of Luxembourg is a tiny, landlocked European nation, tucked in between Germany, France and Belgium. At a surface area of 2,586 square kilometers, it is slightly smaller than the state of Rhode Island (2,706 square km). Several languages are in common use: Letzeburgesch, a Germanic dialect which is used for everyday, informal communication; French, the official language of government and most web sites; German, taught in schools; and a smattering of English, as well. The capital of Luxembourg City and its surrounding suburbs contain roughly one quarter of Luxembourg's population of 440,000. There are two main geographic regions: the forested Oesling plateau, covering the northern 32% of the country, and the Gutland, covering the remaining 68% in the south. In the 19th and 20th centuries, iron production was the most important industry in Luxembourg, but the mines are now depleted, and the country has made a successful transition into the high-tech world, with special emphases in banking and telecommunications.